Until approximately fifty years ago and, in some areas, until more recently, children were delivered at home by midwives. The midwife was a special person who became a “ritual relative” of the family whose children she delivered. As ritual kin, she had obligations to the family, such as attending the baptism and the wedding. In return, the family had ritual obligations to her and gave her gifts at Christmas and other holidays. Birth, when it was performed by a midwife, was replete with ritual acts that were supposed to insure easy delivery and the health of the mother and child. These days delivery is in a birthing facility in a larger town, usually the one that serves as the regional center, and many of the rituals associated with birth are gone. People do still conduct a mock attack on the paternal grandmother of the infant, tearing her clothes, ostensibly to make diapers for the baby. This is a carnival-like event meant to celebrate the arrival of the baby; it is not an actual attack. A special meal marking the arrival of the mother and baby home from the birthing center is another celebratory event. The most important ritual tied to birth is baptism. Baptism now takes place in church. 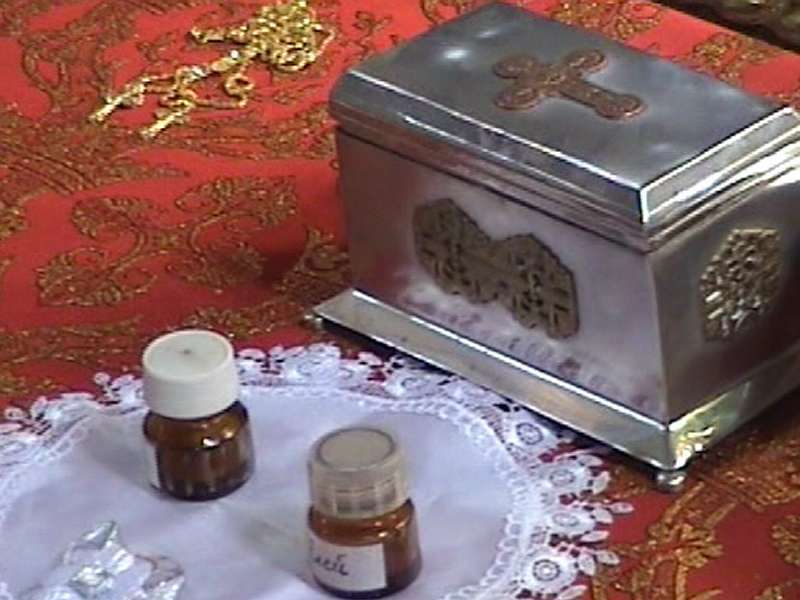 The godparents of the child take the infant from the parents (the parents are not allow to be present at the service). 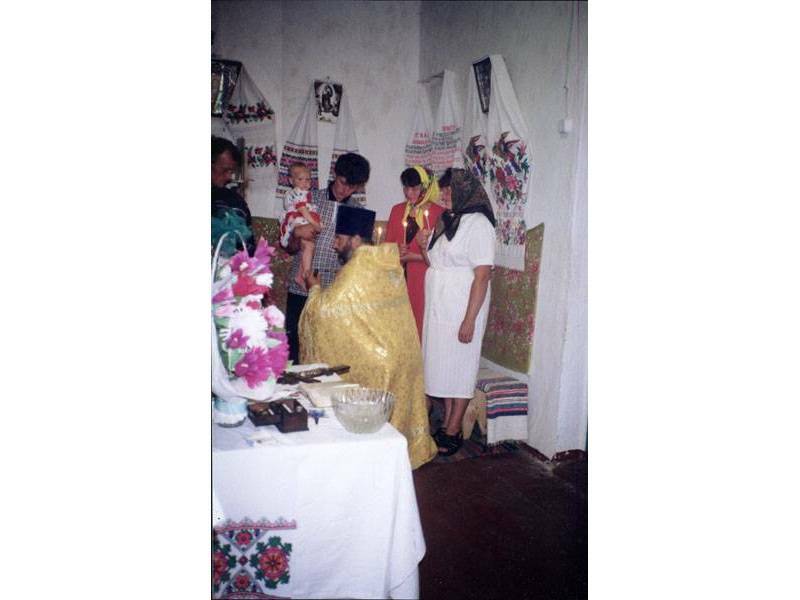 The godmother provides a cloth or kryzhma and the godfather provides a bread and a bottle of horilka to pay the priest. The child is held by the godmother if it is a girl and by the godfather if it is a boy. The baptism is followed by a celebratory meal. 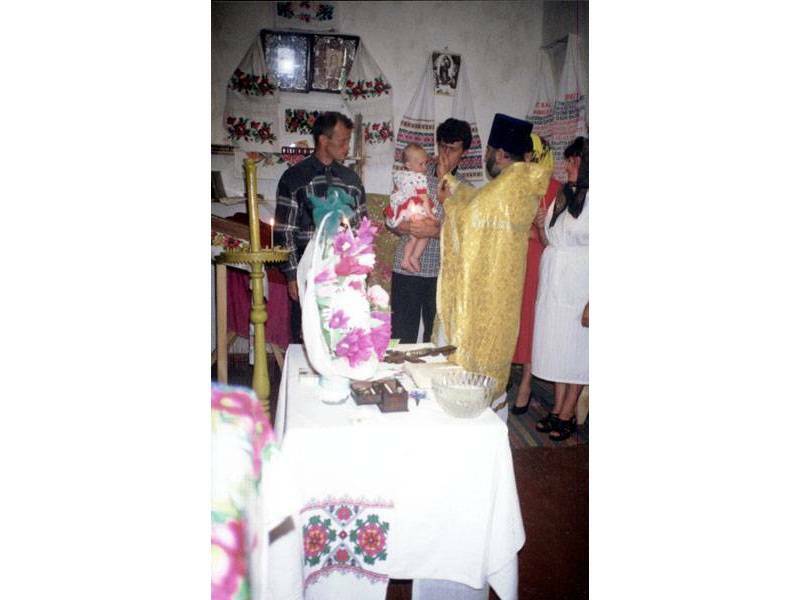 We photographed a baptism in Dobranychivka, Iahotyn region, Kyiv province in 2000. Many people also have a special presentation ritual 40 days after the birth when the child is presented in church and the mother is cleansed and allowed to resume attending religious services. Baptism, because it is a religious service, was frowned upon during the Soviet period and those people who received baptism usually did so secretly. The effect that this has had on current practice is to push back the date of baptism. 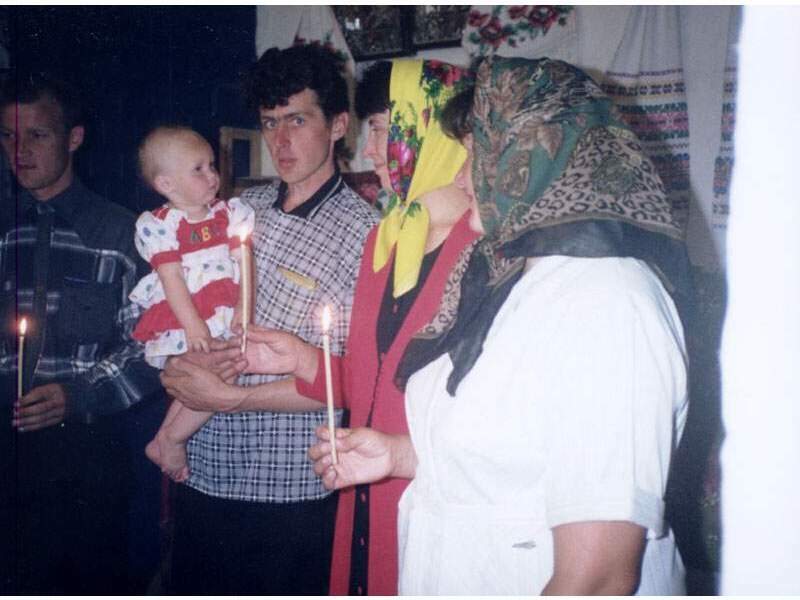 Before the Soviet period, children were baptized soon after birth. Now children can be one year old and older. While the many beliefs associated with midwifery have mostly disappeared, beliefs associated with pregnancy and early childhood remain. There are many taboos on the pregnant mother. She may not steal, lest her baby be marked with a port wine birth mark in the shape of the stolen object. She cannot sew on Fridays, the day of St. Paraskeva, lest her child have webbed feet. These are but two examples of pregnancy taboos. After delivery, taboos are also plentiful. The child’s first bath must contain certain herbs. The mother and child cannot leave the farmstead for 40 days. Diapers cannot be left outside to dry after dark. 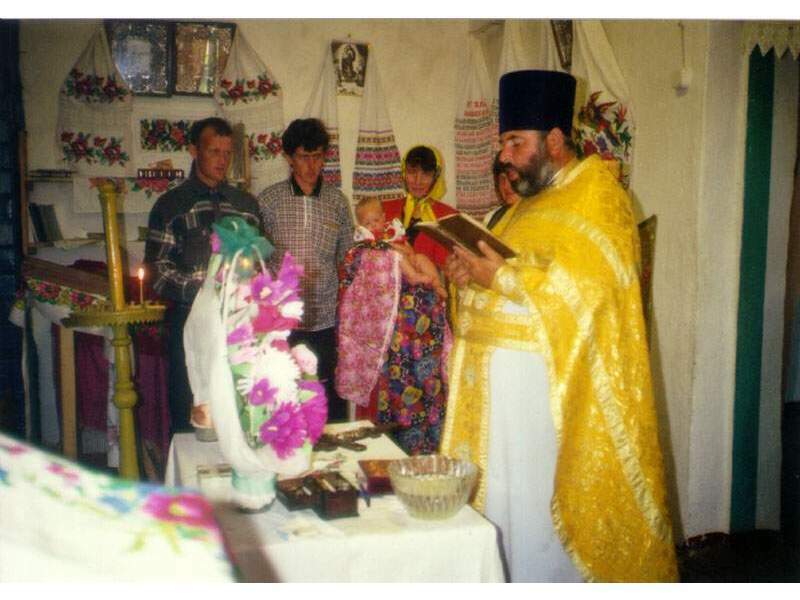 This is an example of a traditional baptism ritual that was recorded in April 2009 in the small town of Lukiv, Tyriis’kyi raion, Volyn’ region, Ukraine. 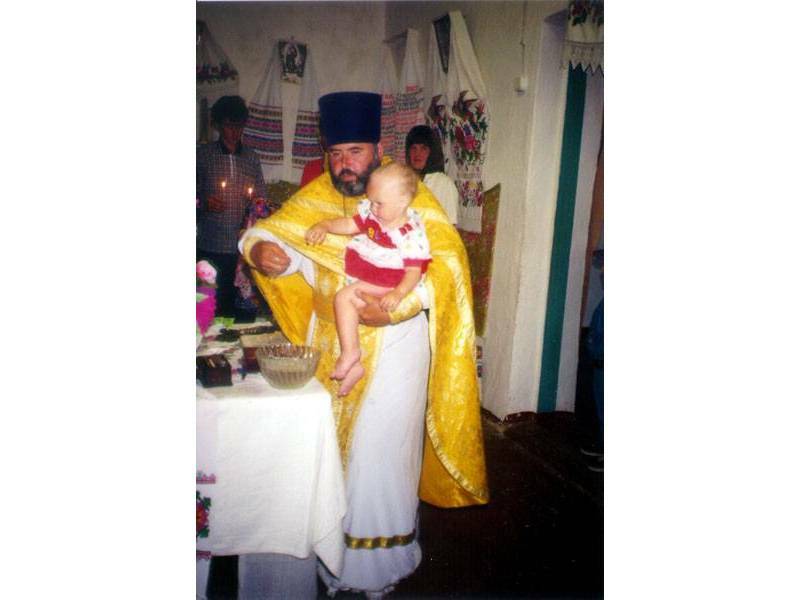 The baptism of a girl named Vaselisa and a boy named Artem happened on the same day and at the same time in the local church. The godparents of each child took the infants from the parents (the parents are not allowed to be present at the service) and held them during the ceremony. 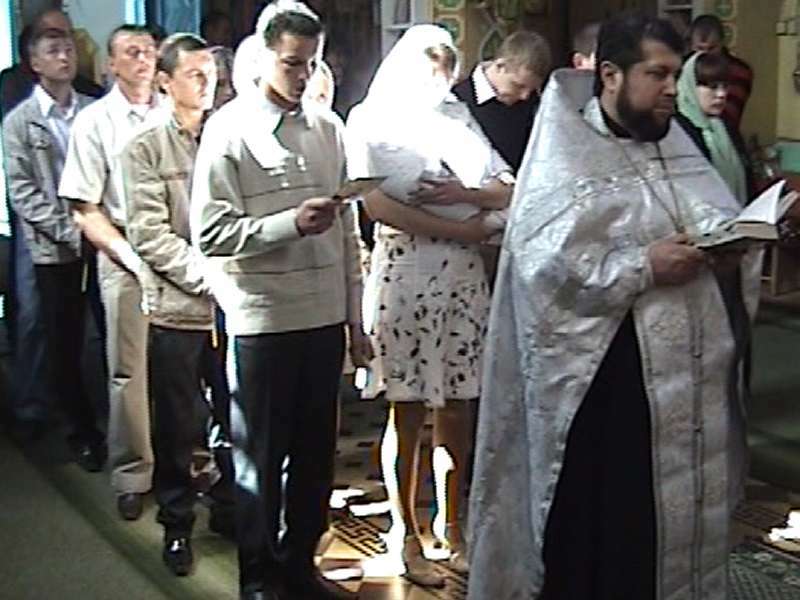 In the past, the godmother was expected to provide a “kryzhma” (a cloth), and the godfather was supposed to bring bread and a bottle of alcohol to pay the priest, but now people usually give money. Previously, if the child was a girl, she was held by the godmother and, if the child was a boy, he was held by the godfather. Nowadays these rules are not that strict and there are instances when godparents take turns holding an infant. During the baptism, each godparent should be able to recite the “Nicene Creed/Viruiu” prayer. Usually a priest recites the prayer and the godparents repeat after him. In this example we can see the influence of North American culture in the blue and pink outfits of the infants. The tendency to dress babies according to their gender is relatively new to Ukraine and was introduced by television from the West. The ritual of baptism is usually followed by a feast at the newly baptized baby parents’ house. 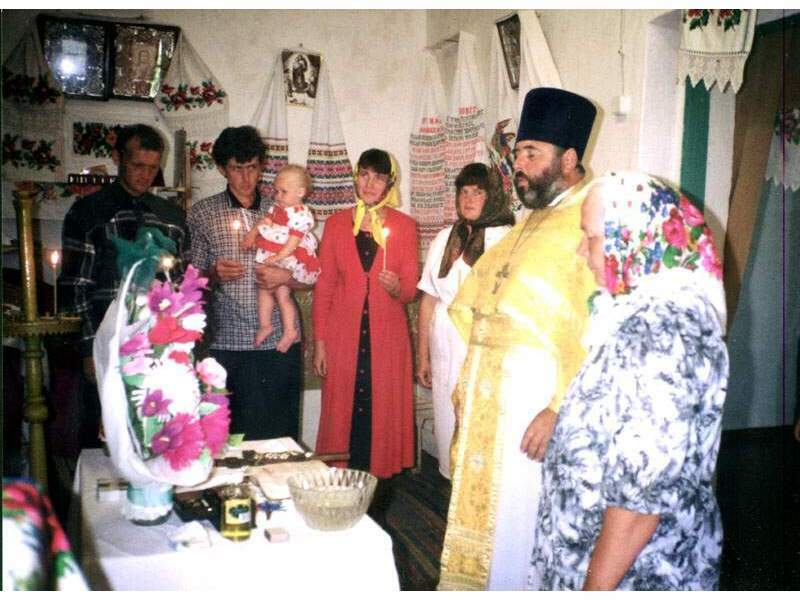 However, some people choose to celebrate Khrestyny (Baptism) at a restaurant. Here are some videos from the same ceremony. The priest is starting the ceremony by confirming the names of the children and reading the opening prayer. The ceremony continues with readings from the holy book and prayers. The priest asks both sets of godparents different questions and they reply they are sorry for their sins. The priest asks all of the godparents if they can recite "Nicene Creed" from memory. The priest anoints the child. After the anointment, the priest cuts the infants’ hair three times, burning it in the candle each time. The priest instructs the godparents about their new responsibilities towards their godchild. The priest gives his blessing to everybody and calls them forth to kiss the cross. At the end of the baptism everyone is invited to the celebration of the baptism at the home of the parents.